This artist's illustration shows the Google Lunar X Prize team Astrobotic's lander on the surface of the moon. Astrobotic and the Japanese team Hakuto plan to fly to the moon together atop a SpaceX Falcon 9 rocket in late 2016. 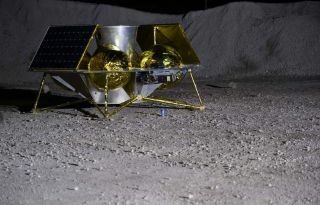 This is definitely a new kind of space race: Two teams competing in a private moon competition have teamed up to get to the lunar surface by the end of next year, potentially sowing the seeds for a sort of lunar NASCAR race. The new Google Lunar X Prize (GLXP) partnership between the U.S.-based team Astrobotic and the Japanese group Hakuto means that the two teams — and perhaps even additional groups, if they decide to sign on — could duel it out in a "Formula 1 race on the surface of the moon," said Astrobotic CEO John Thornton. At the moment, GLXP representatives require that at least one team have a launch scheduled by Dec. 31, 2015. The deadline for completion of the prize itself is exactly one year later, on Dec. 31, 2016. Astrobotic and Hakuto have created a partnership that will allow both teams to share the cost of flying to the moon atop a SpaceX Falcon 9 rocket in the second half of 2016, Astrobotic and Hakuto team members say. Thornton is also speaking with representatives from about half of the other teams currently competing for the X Prize, to see if any of them are interested in joining Hakuto and Astrobotic aboard the rocket. "We will be flying with Hakuto to the surface of the moon," Thornton said during a news conference today (Feb. 23). "When we get to the surface, we will deploy our rover and deploy Hakuto's rover, and then, together, we will drive off as fast as possible to win the Google X Prize. It'll be a full-on race once we get there." The teams have also penned an agreement that will allow them to share the prize money if one of the teams that flies on the Falcon 9 rocket were to win. Thornton thinks that the Falcon 9 should have room for almost every GLXP spacecraft if the other teams decide to partner with Astrobotic and Hakuto. In Thornton's ideal scenario, each team would deploy its spacecraft to the surface before the start of the lunar robot race. Once the race starts, however, each team is on its own. Astrobotic's Andy rover — deployed from its Griffin lander — and Hakuto's twin rovers, Moonraker and Tetris, will need to individually perform the tasks in order to win the prize. "We envision a 'NASCAR on the moon' scenario, where competing teams land together, and countries can cheer on their team to the finish line," Thornton said in a statement. "Hakuto is the first team signed to fulfill our dream of the first race beyond Earth's orbit." The race itself could even be televised, with the rovers beaming back images to Earth for people on the planet to behold. Both the Astrobotic and Hakuto teams were recently awarded "milestone prizes" by a panel of GLXP judges. These cash prizes in three different categories serve as rewards for teams that develop and test new technology as part of the private mission to the moon. Astrobotic won $1.75 million in the imaging, mobility and landing categories, while Hakuto got $500,000 as part of the mobility milestone prize. The overarching goal of the GLXP competition is to help create a thriving lunar exploration industry, and representatives with the organization are happy to see this kind of collaboration between teams for that reason. "We are delighted that two of our teams have engaged in this partnership for their Google Lunar X Prize missions," Andrew Barton, director of technical operation for GLXP, said in a statement. "Stimulating new business ecosystems is one of the core goals of any X Prize competition, and this joint venture is an excellent example of how humanity's commercial and economic interests will expand into space in the coming years. This announcement builds on the progress seen during the recent Google Lunar X Prize Milestone Prize awards, and we look forward to the teams furthering this momentum with the news of a confirmed launch contract."